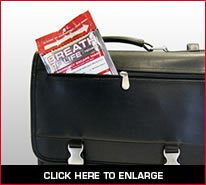 Vacuum-packed and portable, the Breath of Life™ Emergency Escape Mask fits into a pocket or purse, for easy accessibility in an emergency. The Breath of Life™ mask protects eyes, nose, ears, mouth and face by preventing the penetration of unfiltered air—inhaled air enters only via the mask filters. Breathing is easy via the mask’s filters and a precision one-way exhalation valve. Particles, acids, alkalis, gases, microorganisms and mustard gas. Smoke and aerosols containing suspected harmful microorganisms including Escherichia coli, Salmonella enteritidis, Serratia marcescens, Proteus mirabilis, Pseudomonas fluorescens, Staphylococcus cohnii, Staphylococcus aureus, Streptococcus pyogenes, Enterococcus hirae, Bacillus subtilis, Bacillus clausii, Bacillus stearothermophilus. The effectiveness of the filter against microorganisms has been tested by the Department of Biology at the University of Ferrara in Italy. Twelve different microorganisms were tested showing effective results of filtering properties between 94.5% and 100%. Protect all your family members with our Family Pack.